The new Akiles CoilMac ER coil binding machine includes the same great look and feel as the traditional CoilMac M but also includes a built in coil inserter for easier insertion of your spiral coils. The Coilmac ER is a fully featured, heavy-duty manual punching coil machine, with a built-in Electric coil inserter. This machine is an ideal parter for mid-volume workloads. High Volume Punching Capacity - Extra wide 13" Single punching length, up to 17 sheets 20lb paper. Top Electric Roller Coil Inserter (Foot Pedal Operated) - This easy to use and durable roller makes coil inserting surprisingly fast and easy. It is strategically placed on the left side of the machine so your coil will clear the punch handle while you are inserting. Cast-Hardened Punching Mechanism - For more durability plus added strength to make punching much easier. Heavy Duty Design - Designed with CAE (Computer-Aided Engineering) technology for strength and durability. Die Disengagement Pins - Specially designed disengageable positions guarantee a clean punch with most odd size paper, making the CoilMac-ER very simple to use. Punching Margin Control -Provides the correct punch-margin-depth for each coil size and maximizes the document's tear resistance. Open Punching Throat and Continuous Punching Guide - For an easy alignment and punching of longer documents up to 26"
Large Waste Drawer & Non-Skid Feet. 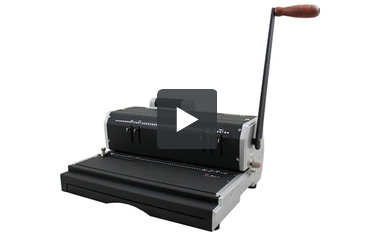 Side Margin Control - Provides an evenly centered punch for all document sizes. Extra Punching Length: Single punch: 13" (for documents larger than letter size) + Open throat and continuous punching guide for punching even larger documents. heavy duty and easy to use. We ordered this machine and had it 2 days later. Works great. Welcome to MyBinding video. 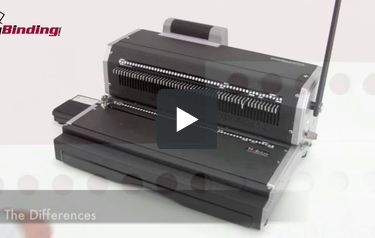 Let's have a look at the CoilMac ER, a 4:1 pitch coil binding machine by Akiles. Much like the traditional and economical CoilMac M, the CoilMac ER adds a coil inserter. Let's watch it in action. With scrap paper, set the side margin control knob so that all punches will be consistent throughout your whole project. And then, disengage any of the dies that you need so that you have no half hole punches. Bring the lever arm down to make your test punch. All set. Starting with the covers, punch through your entire document until all your holes are punched. 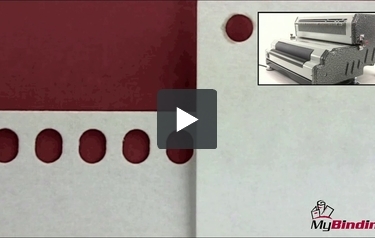 The CoilMac ER has a punch capacity of 17 sheets of 20lb paper per lift. With all your pages punched, assemble your project together and select a coil. Carefully spin the end of the coil onto the project, threading the first few holes. Then depress the pedal and place the coil up against the rubber wheel. If you operate the pedal with your foot, then you can have both hands free to work with your project. Spin the coil all the way through the spine and crimp the ends with crimping pliers. All of the punched chips fall into the chip tray that's below and accessed from the front. And that's it. That's the CoilMac ER by Akiles. For more demos, reviews, and how to's on this product and many more, check out MyBinding.com. Transcript: Welcome to MyBinding video. This video is made to help you understand the difference between the regular and the plus models of the CoilMac line. Akiles makes four CoilMac machines, the M, ER, ECI, and EPI, and their corresponding Plus versions. Side by side, each model looks to be very similar. They have the same features but have two major differences. Transcript: Welcome to MyBinding video. This video compares the CoilMacs ER and ER Plus. Let's first look at the similarities. Both of them have 4:1 pitch and a 13-inch throat opening. And it's an open throat design, allowing you to use virtually any size piece of paper. These machines allow you to punch up to 17 sheets of 20lb paper per lift. And the binding capacity with the electronic inserter is 7/8 inch. There is an adjustable depth of margin control knob. Within the CoilMac line, it is the ER and ER+ that introduces the electronic inserter. And finally, both of them come with a coil selecting tool. Welcome to MyBinding video. This video compares the CoilMacs ER and ER Plus. Let's first look at the similarities. Both of them have 4:1 pitch and a 13-inch throat opening. And it's an open throat design, allowing you to use virtually any size piece of paper. These machines allow you to punch up to 17 sheets of 20lb paper per lift. And the binding capacity with the electronic inserter is 7/8 inch. There is an adjustable depth of margin control knob. Within the CoilMac line, it is the ER and ER+ that introduces the electronic inserter. And finally, both of them come with a coil selecting tool. There are two main differences between the ER and ER Plus. The first is the number of disengageable die pins and the second is the type of hole punched. Fifty-four pins on the ER+ are fully disengageable, allowing for a completely clean and professional punching of any size paper, while the ER model has only five disengageable die pins to be used with the most common sizes of paper. The CoilMac ER punches round holes that are 4mm wide. The ER+ punches oval holes. The difference is oval holes tend to work better with thicker documents. Also, oval holes are easier to begin the threading process of the coil onto the spine. According to your budget and your needs, the choice is yours between the CoilMac ER and the CoilMac ER Plus. So for more comparison videos, or demos, and how to's, check out MyBinding.com. Fairly new on the market, the Akiles CoilMac ER is a coil binding machine that is designed for small to medium offices who may not want to spend a whole lot of money on a binding system. Built along the same lines (and in fact using an identical platform) as the Akiles classic CoilMac-M, this system includes a small electric roller for inserting coil, a feature designed to further enhance productivity. Let's take a closer look now at this machine, its strengths and weaknesses. The Coilmac-ER punches a four to one pitch hole-pattern. This means that there are four holes per inch and forty-three round holes on a standard 11" binding edge. These parameters mean that this machine can be used with standard four-to one-pitch spiral coils, and in sizes that range from 6mm and 50mm. The small coil inserter that is included, however, will only work with spines that are up to seven eighths of an inch thick. Any larger, and you will need to spin the coils by hand. The ER's punch is capable of handling seventeen pages at a time, and is also rated for use with two plastic covers at a time. This rates the ER as among the best on the market for its price point. As stated above, the CoilMac-ER is essentially a carbon copy of one of the most popular, durable, and reliable coil binding machines on the market, the CoilMac M. The difference is that the ER comes with the added convenience of an electric coil inserter. This makes the ER likely one of the most feature-rich coil binders on the market for its price. The ER comes with a pair of high-quality crimping pliers. These pliers are an absolutely essential part of the binding process, and around a $30 value. The coil inserter included on the ER is fairly small, and is located on the back of the machine, which is perhaps not the most convenient placement. There is only one roller on the inserter (most have two), and it is only about six inches long, making it difficult to impossible to bind larger documents, or large numbers of documents. There are machines on the market that can do much heavier duty work, but if you are on a budget, and won't be using the ER much, it is still a good value. The thirteen inch punching throat is great for use with most common paper sizes, but is not the best for punching odd sized documents. Attempting to do so will likely result in incomplete holes at the end of your documents. The CoilMac-ER has a few disengageable dies to allow you to punch the most common sizes of paper. However, special sized documents will be difficult to bind with this machine. Again, for the price point, the ER would be a great choice for smaller businesses that won't be using the machine for huge jobs. Higher-volume users will want to look at machines that feature a larger manual punching capacity, or an electric punch. Recommendation:Considering that the ER costs only about 50 dollars more than the CoilMac M, the included inserter and crimping pliers make the ER the clear choice if you are considering both machines. However, higher volume users may want to consider stepping up to the Akiles CoilMac ECI or the larger electric CoilMac EPI. Where can I find coils for the Coilmac ER? You can find more than 50 different colors of Spiral Coil on our site here. Just pick the color tha tyou need and then choose your size (coils start at 6mm and go up to 50mm). The coil that you need will be 4:1 pitch (that is the standard) and is relatively inexpensive.